What happens to your body when you teleport? Home /Science/What happens to your body when you teleport? Teleportation may seem like something awesome that could save us from a lot of trouble, especially when we want to travel huge distances in the shortest amount of time possible. But one can’t help but ask: What happens to your body when you teleport? 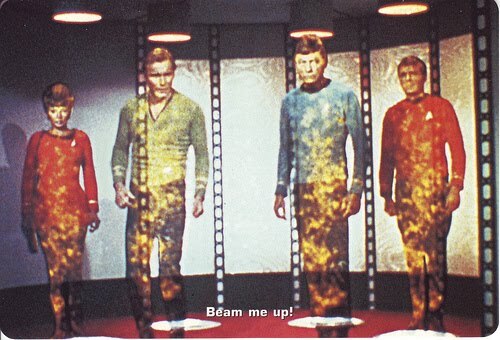 We have how teleportation could work for us in popular culture, escpeically in Star Trek tv shows and movies. But what really happens behind all those fancy lights and buttons? In a possible future, if I am to be teleported to another place on Earth, what happens to the original me? Am I really wiped and the teleporter just makes another copy of me at destination? What happens to my conscience? Fans of the Star Trek series but also scientists are trying to answer this question for some time now. With all these opinions flying all over the Internet, we must start our quest from the undeniable facts of the best case scenario of the process: during the deleportation, the human body is scanned down to the molecular level. Every molecule of the body is transformed (converted) to energy, that energy is beamed to the destination where it is reconstructed to its original form (including your firing neurons). Phisically, there is no difference between the original and the body that arrives at the destination. But what happens to our conscience during this process? Is the original consciousness destroyed and a new one created, or it is preserved? Wikipedia says that teleportation “is the theoretical transfer of matter or energy from one point to another without traversing the physical space between them“. although many may argue that this is a case of deconstruct and rebuild using the exact same materials, it does not necesarilly imply that the original me is truly preserved during this proces. As scientists are still trying to figure out what exactly makes conscience and how it works, I have a hard time trying to accept the fact that the transporter, pretty fancy and accurate in its processes, is deconstructing down my body to molecular level. No matter what comes out to the other end of the line, all my senses tell me that the deconstruction of the body means death, and there is no reconstructing from that. Of course, no one around will notice this, the entire universe will not miss my conscience being wiped out, since another me will be constructed at the destination. But I will miss…everything…forever…from that point on! This is the best case scenario, because the teleport could also work using the fax-machine principle. Basically, it could copy each molecule of your body, print it on the other side of the line and desintegrate the original. You can see this exact teleportation principle in the movie Prestige directed by Cristopher Nolan. A video posted on CGPGrey’s Youtube channel may shed some light on the matter. In the episodes of the famous Star Trek series, we can see how people can be beamed from one end of the universe to the other end, and all these travelers arrive in one piece, perfect condition. Of course, when I am writing these words I am not taken into account the possibility of accidents during these routes. But the reality may hide an ugly truth that could make you avoid such a device.